Once a task is created, you can add more comments or manage the ones you already wrote. You wrote down in a task something you didn’t want too. You've spelled something wrong and it bothers you. Click on the menu icon next to a comment and select Edit. If you want to get rid of the comment completely, select Delete. You can Edit and Delete only your comments. But beware, there will be a note saying the comment was deleted. Click on the menu icon next to a comment and select Quote to start your own comment with a reference to someone elses. Sometimes it can be tricky to find that one specific comment if there’s a lively discussion going on in a task. Pin important comments and they will stay on top of the discussion. 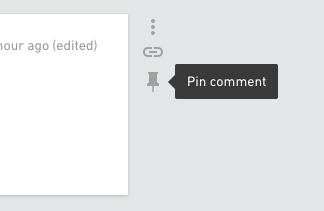 Select Pin icon next to a comment.